Protected pets from fleas and ticks, allowing their owners to enjoy more of the good times with their pets in the summer and all year round. 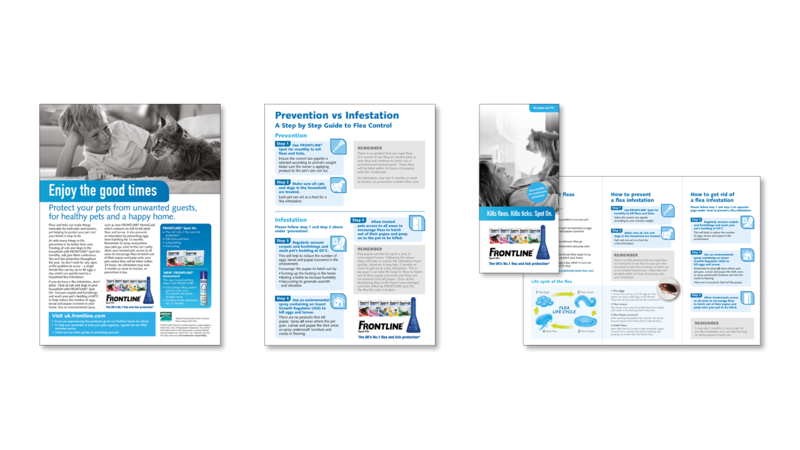 Merial’s summer campaign was going to be reaching out to the pet owning public across the UK, educating them about the importance of ‘monthly’ flea and tick treatment for their cats & dogs. 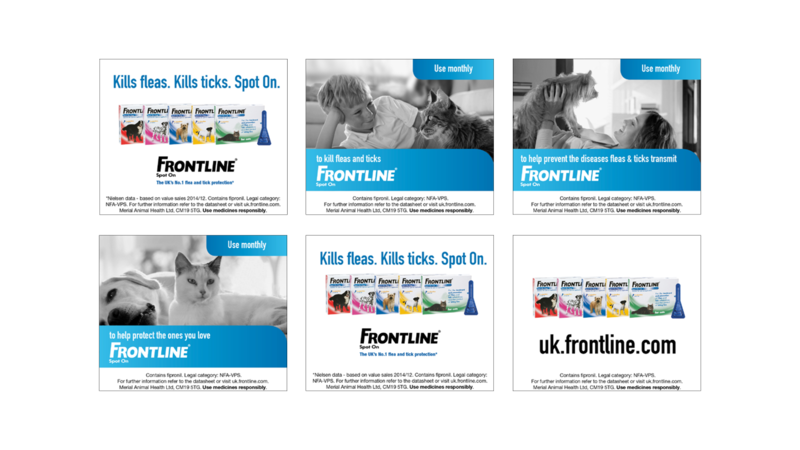 FRONTLINE® Spot On has invested in a comprehensive communications campaign, including a National TV Campaign, National Magazines, PR (featuring Ruth Langsford), Digital (online engagement with pet owners and a new pet owner website). Bang were commissioned to develop the campaign across a range of channel specific material. Bang developed a range of material including a promotional pack will allow vets to connect with pet owners and to have them seek support in ensuring their pets remain protected from fleas and ticks, allowing them to enjoy more of the good times with their pets in the summer and all year round. The pack contained consumer leaflets, a reversible poster with fixings, counter mat, shelf wobblers, counter promo card inserted into a plastic unit, SQP/Pharmacist quick reference guide inserted into a plastic unit. 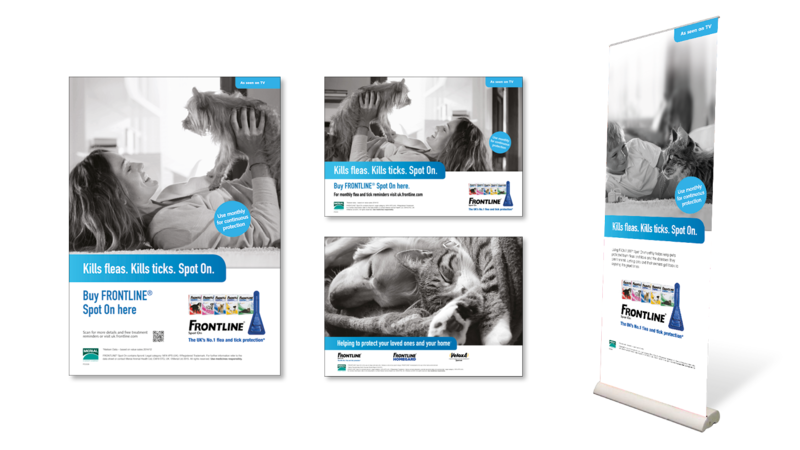 Bang created a digital campaign to amplify the importance of monthly application and to keep FRONTLINE® top of mind among pet owners and direct pet owners to FRONTLINE® stockists. Creative was developed for various channels including Vivaki AOD targeting pet owners searching for pet products online and Admaxim where the location of FRONTLINE® stockists will be used to serve mobile display ads to those pet owners who are online within these ‘tagged’ areas. These pet owners would be provided with the nearest FRONTLINE® stockist. Znaptag was also used to grab the pet owners attention by overlaying pet and pet-care images across the Znaptag network with branded and educational ads.